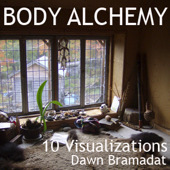 The series of visualizations that you will find here has been designed so my voice will help the cells of your body release layers of belief in separation and duality that act as clouds… shadows… around the core of Light that is their highest potential and your true nature. With guidance from the spirit realms and the Ancestors present in your body, I call upon you to remember your wholeness, beauty and perfection, encouraging joyful responsibility and active serenity in the embodiment of your destiny as the Living Grail. Just click on the link on the left to hear the audio, or just right click (Ctrl-click on the Mac) to download the mp3. 2 – Balancing Left and Right In order for us to be able to give unconditionally, and to manifest our true Selves, we must first learn to receive Life unconditionally – as a gift that we accept with gratitude. 4 – Opening Chest and Belly We have learned to separate ourselves in two, placing a barrier at the level of the solar plexus to protect ourselves from all the memories and beliefs we have somatised and sublimated into the belly. These beliefs about ourselves have been programmed through our parents our ancestors – they are not who we really are. We need no longer be afraid. 5 – Realignment of Skeletal Structure The skeleton carries the emotional and psychological structure that we have learned from our genetic lineage. Consciously holding ourselves differently changes our outlook on life. 6 – A Tale of Two Caves Releasing ancestral programming and awakening to the power, beauty and magic held in your belly. 7 – Roots, Flowers and Crystal Fruits We are able to transform our bodies alchemically to the extent that we accept our roots/connectedness with the Earth and All our Relations. 8 – Medicine Wheels in the Body Our bodies also hold these sacred circles of connectedness. 9 – Roots, branches and flowering hearts Nourished by conscious connectedness with the Earth, our hearts open and Humanity blossoms to its full potential. 10 – Blood and Nerves: Earth and Heaven Your body is an alchemical vessel – a crucible – where Heaven and Earth are joined through your awareness to formed the Divine Child that is Oneness. Rejoice! How generous of you and thank you for your meditations. I have just begun my new journey with your gracious help. Wonderful!